Apple has released the final version of macOS Sierra 10.12.6 for Mac users running the Sierra operating system. The update includes bug fixes and security enhancements, but does not provide any new features or major changes to the operating system. Separately, Mac users running El Capitan and Yosemite will find security updates available as well. The Mac will install and update to the latest version of Sierra and then reboot when complete. Using a combo update in Mac OS is fairly simple, as is using the delta update. Nonetheless, most Mac users are better served keeping things easier by just installing the update through the Mac App Store. 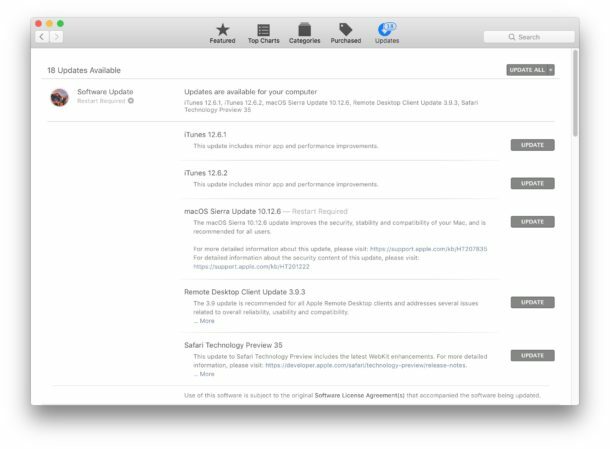 Those security updates are bundled into macOS Sierra 10.12.6 if applicable, which is why there is not a separate security update release for Sierra. Separately, Apple has also released iOS 10.3.3 update for downloading on iPhone and iPad, and minor updates to tvOS and watchOS. macOS Sierra 10.12.6 is separate from the ongoing MacOS High Sierra (10.13) release, which is currently in beta but due for public release in the fall. My pet hate with Apple updates on my iMac is they never inform you how much data it will take. Is that too taxing a task? Move out of your mommy’s basement, and get a real internet connection instead of tethering your phone to your Mac. Sheesh, you Millineals are a piece of work! Not everyone has fiber coming down the chimney. Some of us have metered sat connections in our rural environs. Is the Yosemite update freezing anyone else’s Mac? Or taking a long time? No but on sierra my Macbook pro doesn’t reboot after installation. It gets stuck on the white startup screen. The black bar does fill up to the end (very slowly) and I never get to the login screen. Have tried to restart the computer literally all day about once every hour, and I’ve also tried to reset the SMC and NVRAM but nothing helps. I’ve no idea what to do next. my father gets stuck with the same problem after updating mac to 10.12.6 . Unfortunately I am to far away to get my hands on the mac but we tried different things via phone. I also found this discussion on apple.com which is solved by some people by deleting some Kernel Extensions. For me (my father) nothing helped because we actually not managed to get into rescue or safe mode. But maybe you have enough luck. My Jan 2014 iMac working fine until I let it update 10.12.6 today. Repeated black screen. Sometimes allows log in, but at some point always stops: either get unresponsive black screen or the unexpected quit screen. Tried different users, killing internet, nothing seems to work. Killed my 2017 iMac last night. Just finished doing a restore. Gonna try again. Spent quite some time yesterday messaging with an Apple tech about my now dead iMac. Tried various resuscitation techniques unsuccessfully. Now I cannot even get a screen, although power still coming because my Superdrive is doing an on-off cycle (clicks as when iMac is booted) every 3 sec or so. Have a GeniusBar appt tomorrow (Sunday). Tech believes that the fact a working iMac was reduced to rubble immediately on update is a “coincidence”. As a scientist and a Mac user since Feb 1985, this is possible, but as someone once said “correlation is not causation, but it does offer one hell of a clue”. after install this update , my MBP early 2015 stuck in logo bar and the bar while install not finish for 12 hour, need help for fix this problem thanks. exactly same issue. seems like reinstalling in recovery mode installs exact same version of OSX (10.12.6), so nothing changes. i dont want to lose any data because of `stable` release (dev-releases should catch those f*ckups). Try running the Combo update on top of the failed installation, sometimes using a Combo Update will fix a problem like that. I personally now only use Combo Update to update my Mac… it seems to work best. Working fine, fast install on a 2012 MBP took less than 10 mins. Didn’t make a bit of difference, nothing significant other than the security updates. I have the same problem, then I bricked a brand new MBP by attempting a time machine restore from the bricked MBP! Double misery. Did anyone find a fix to this yet – can only boot from an external drive now. It looks like Apple has messed up with the Retina Display Driver with Sierra 10.12.6 upgrade. Just a gut feeling at this moment. The issue, for me, started with intermittent stripes of various colours and then finally the white frozen box greeting me all the time. I am relatively fine with the Blue screen of death of Microsoft. The experience with Apple seems to be bad. With Microsoft, it was democratic, all vendors had the power to roll out updates for their hardware in quick time and they did validate it in depth. With Apple, it is an autocratic world and we need to wait until they roll out the patch. Worst yet, the concept that Apple owning a lean set of hardware and also building support drivers doesn’t seem to be working. As I Googled the issue, Mac OS update causing the freeze seems to be a regular issue. And it was also attributed to variation in hardware. So which model is good ? Apple or Microsoft ? Halfway thru a promised 31 min. upgrade to 10.12.6 on MacBook Pro all went black. Esc key occasionally lights up on own, or if I brush my hand across the track pad. Work computer in a mostly Microsoft environment. Waiting now for an in person tech guy and crossing my fingers it may eventually finish the install on its own. Reading what you all have experienced, am not very hopeful. Sigh.